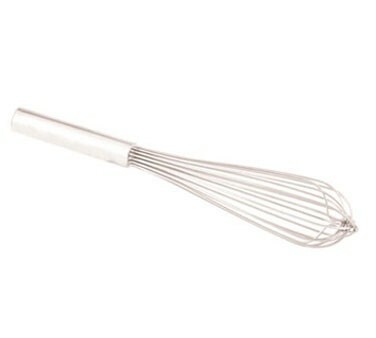 Crestware FW10 Rigid Wire French Whip 10"
TigerChef > Smallwares > Kitchen Utensils > Cooking Whips >< French Whips > Crestware FW10 Rigid Wire French Whip 10"
✔ 18/8 stainless steel construction✔ Rigid wire✔ Sealed ends✔ Dimensions: 10"
$1.81 Winco FN-10 Stainless steel French Whip 10"
$13.96 Kuhn Rikon 2365 Easy Store Whisk 10"
$1.32 TigerChef Stainless Steel French Whip 10"
$4.79 Crestware FW14 Rigid Wire French Whip 14"
$5.39 Crestware FW16 Rigid Wire French Whip 16"
$7.39 Crestware FW24 Rigid Wire French Whip 24"
$5.79 Crestware FW18 Rigid Wire French Whip 18"
$4.59 Crestware FW12 Rigid Wire French Whip 12"
$2.56 Winco FN-16 Stainless Steel French Whip 16"
Use the Crestware FW10 Rigid Wire French Whip 10" for making whipped cream, fluffy omelets, or for whisking thick batters. Designed with long, narrow wire loops, this French whip efficiently combines ingredients and removes clumps from liquids for a light and fluffy result. Highly durable and convenient to use, this French whip is made from rust-resistant 18/8 stainless steel and has a sealed, rounded handle for a comfortable and steady grip.